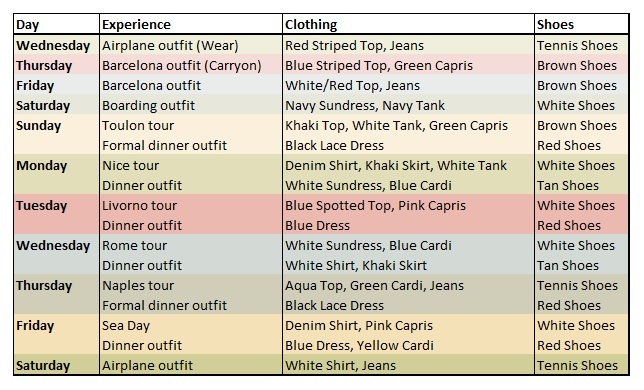 So before my big trip, I planned out some outfits so I would be able to pack as minimally as possible. I wanted to followup on that post to let you know how successful I was. First up, I didn’t end up doing laundry on board the cruise ship. I used my cruise credit for drinks and cupcakes. I’m a glutton, deal with it. The only difference that made was I needed to double up on a few tanks for layering and bring the full amount of underwear to last me the trip. When I got around to packing it all, I realized I had more than enough space. I was pleased because my plan was to bring home souvenirs so I was more than set. Just to be safe, I weighed my luggage and the heaviest bag was 32 lbs, so I had well over 10 lbs of “souvenir space” to work with. Perfect! 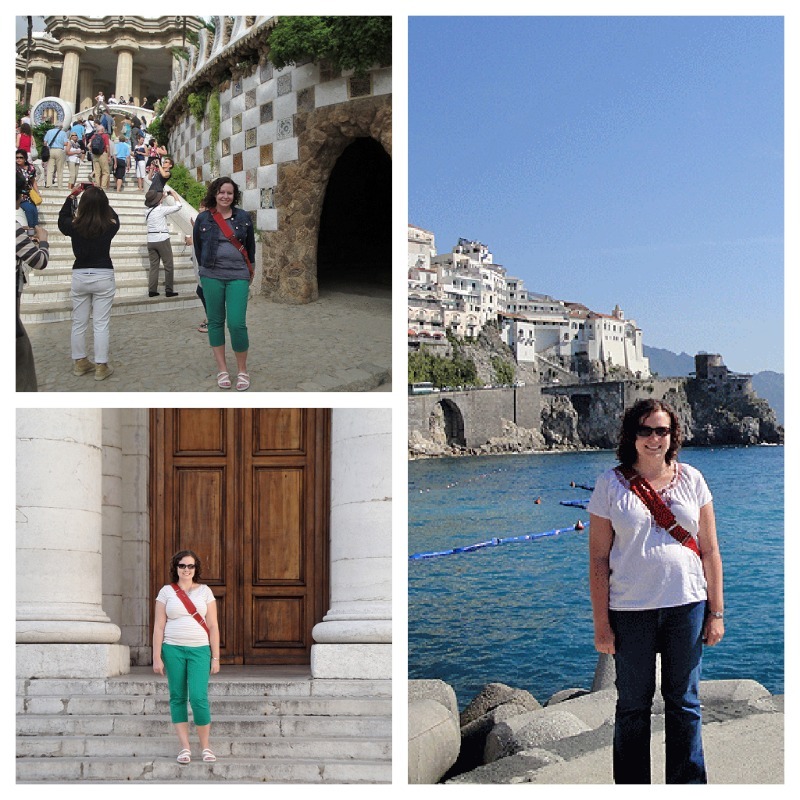 Here you can see me in my green capris and blue striped shirt in Park Guell (Barcelona), my green capris and tan top in Toulon, and in jeans and a white top in Amalfi. I ended up swapping some outfits around, like after a freak rain storm soaked my outfit in Monaco; that outfit needed some time for the pieces to dry so I just swapped what day I wore things. Same thing with my landing day, I ended up not changing until dinner. I was able to do that because I chose to pack 3 additional pieces over what I listed in my planning post. I brought a dinner sundress for my time in Barcelona (since I didn’t want to wear the same thing I wore to the beach or to hike) and I brought one casual outfit, some sweats and a t-shirt. That was a great choice since I just lounged on our room’s balcony for much of the time. I wanted to be cozy on those crisp Mediterranean mornings. Since I did that, there was an entire outfit I never ended up wearing. I had overpacked! Some of my most versatile pieces were my denim shirt, my khaki skirt, and my pink and green capris. 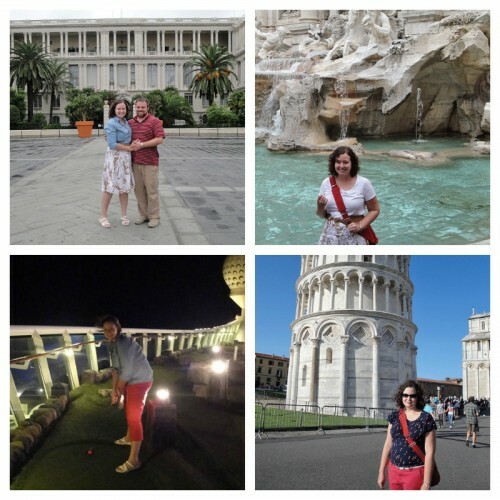 You can see me wearing these pieces in (clockwise from top left) Nice, Trevi Fountain in Rome, Pisa (that’s the Leaning Tower behind me), and on board my cruise ship the last night playing mini golf. I always felt comfortable in my pieces (always pack clothes you’ve worn several times before!) and I never stood out in my pieces. I chose colors on a same color palette to maximize mixing and matching–lots of browns, blues, greens, pinks/reds, and whites. 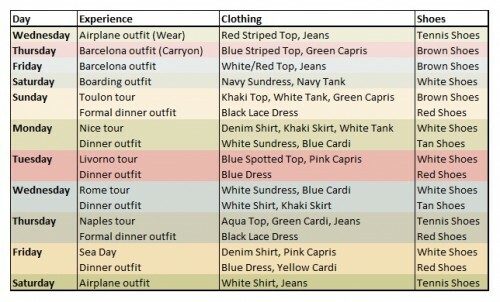 Before packing, look at what colors highlight your closet and try to choose 3 or so favorites with 1 or 2 neutrals.